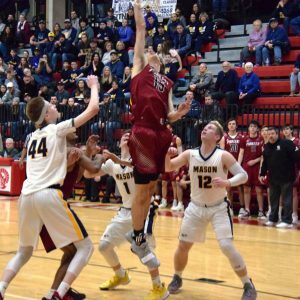 After capturing a district title last week, Riverview Gabriel Richard sought to continue its playoff run in Division 3 at Whitmore Lake on Tuesday. Standing in Richard’s way was Erie Mason out of the Lenawee County Athletics Association. In what seemed like a true road game for the Pioneers, it was the Eagles and their well-traveled fan contingent that ultimately celebrated a 47-36 victory n the D3, Region 22 semifinal. Both teams made it known early and often that the three-ball was going to make or break the game. In fact, of the 30 total field goals made in the game, 16 came from beyond the arc, with each team accounting for eight such makes. Richard (17-5) trailed by a single point after one quarter but Mason (21-2) started off the second period on a 13-0 spurt that put the squad up by 14. That forced Pioneers coach Kris Daiek to burn a timeout, telling his team to just relax. Daiek’s team responded with an extended 13-0 run of its own that went midway of the third quarter, trimming the Mason lead back down to one. The Eagles, however, were able to break out of a funk and elevate their lead back up to double-digits. They tallied just nine points in the final quarter but that was largely due to them slowing the pace, playing keep-away from Richard to gradually drain the clock. The 36 points scored is the second-fewest total for Richard all season, only one point more than their lowest total they set just five games prior back on Feb. 18 against Wyandotte Roosevelt, which is a D1 school. For Mason, it was also its lowest scoring output since netting just 31 points in the season opener. Overall, it was that defensive effort from the Pioneers that Daiek was most pleased with. “I thought defensively, we played really good,” Daiek said. “(Erie Mason) is averaging 60 to 70 points per game, top-10 in the state. We knew they could shoot and I thought we defended pretty well. I thought we did a good job on (Mason’s Joe Liedel, Bryan Sweeney, and John Sweeney) in the first half especially. Kevin Tuttle led Richard in scoring with 12 points and was responsible for two of the Pioneers’ eight made 3-pointers. Fellow senior and Tuttle’s backcourt mate Matt Silka joined him in double-figures with 11 points. Garrett Balazsi added six, Jacob Henderson chipped in with four, and Deshon Elam had three. For Mason, 2018 all-state honorable mention Joe Liedel poured in a game-high 18 points. Liedel, along with Jake Trainor and the aforementioned Bryan Sweeney, accounted for all but four of the Eagles’ points. Bryan Sweeney’s 11 points all came in the first half. John Sweeney was held scoreless. 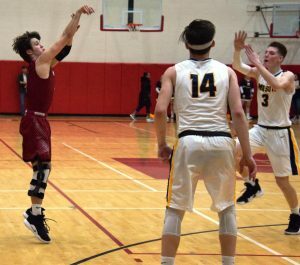 The Pioneers suffered some key injuries during the season, namely to Silka and Balazsi at different points and still muscled their way to a second district title in four seasons. Despite the exit from the regional round this year, Daiek likes the direction of this particular team and the Richard program as a whole. 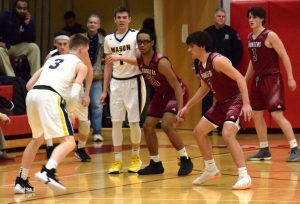 Mason advanced to the regional finals back at Whitmore Lake on Thursday to play Detroit Loyola.